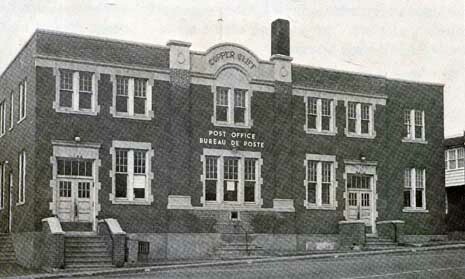 The first postmaster in Copper Cliff was F. L. Surry. His term was from January 1, 1890 until February 21, 1891. He was followed by Thomas J. Byers, born in 1855 in Ontario, Scotch origin. He worked from May 1, 1891 to November 29, 1894. A. E. French worked briefly as postmaster from February 1, 1895 to November 30, 1895. Fred Hamilton was postmaster from February 1, 1896 to January 27, 1900. Norman Craig Kilpatrick served in the Canadian Over-Seas Expeditionary Force in WWI, enlisting in January 24, 1916. Margaret Hannah Kilpatrick was postmistress from December 5, 1914 until May 11, 1931. Her sons were assistant postmasters. Harold Nicol, was assistant in 1920, living at 2 Clara Belle Road, followed by Norman Craig as assistant in 1925. In 1920 son Eric died of bronchial pneumonia at Cameron Falls, Nipigon. He was a Mining Engineer. After Margaret’s death in 1931, Norman became postmaster August 15, 1931 and served until January 3, 1934. The next postmaster, also a veteran of WWI, was William Tiplady. He was born in 1892 in Leeds, England. Prior to enlistment William was a butcher. William and his family lived at 17 Power Street. He served as postmaster from March 7, 1935 until December 4, 1936, and died suddenly of coronary thrombosis. His wife Eva Adelaide White was appointed acting postmistress. Their son Charles William Eric Tiplady was killed in WWII. James Low Spalding, a veteran of WWI, was postmaster from July 6, 1937 until October 30, 1956. He and his family lived at 39 Power Street. Robert Allan Kennedy served as postmaster from November 1, 1956 to May 27, 1968, followed by Kenneth M. Stephenson from August 28, 1968 to May 9, 1972. Upon his retirement, the next postmaster was Rejean Couture, followed by J. Archambault from January 19, 1976 to March 2, 1981 and John F. Watters.